I had a look on the most popular social media sites to gain an understanding of what site gets the most traffic in relation to ATM faults and complaints. I was also looking into what form of complaints are popular on each of the sites. I was only really able to find any user interaction on Twitter, of which there was a great deal. 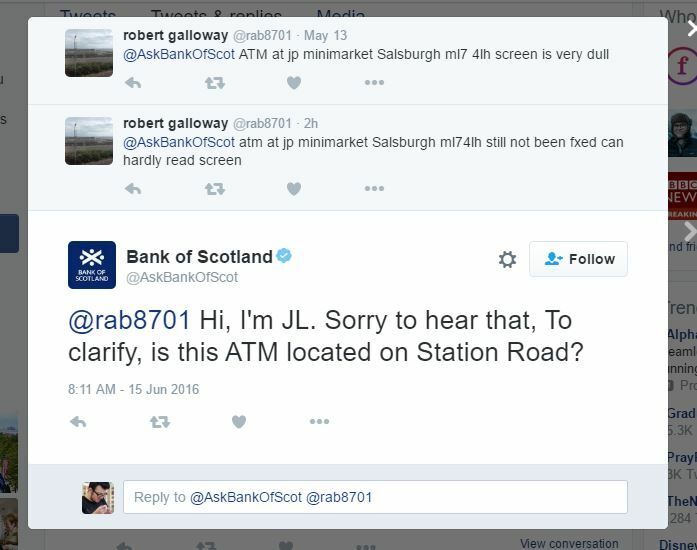 There was a few people using Twitter to contact the banks and tell them that there are ATM faults. 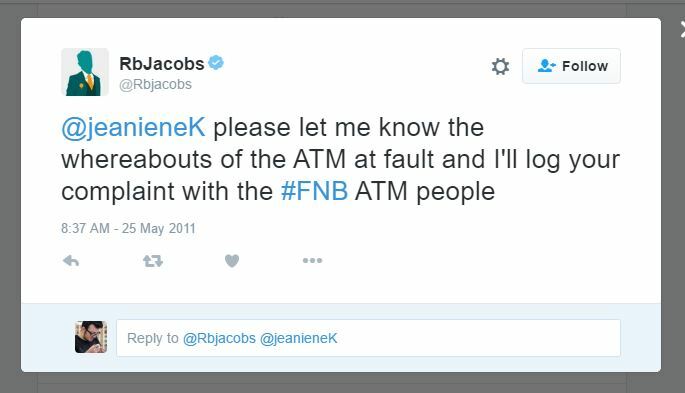 However, most people were using Twitter to inform others that there is a fault with a certain ATM and to avoid it, tagging the bank that is involved. 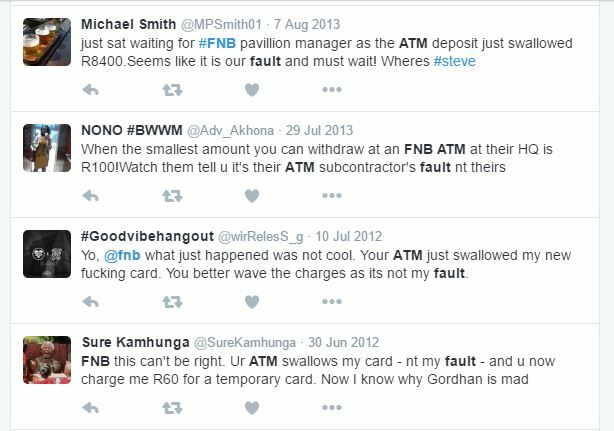 The general feel was that lots of people are upset and are blaming the bank for the ATM faults when using Twitter. The most common complaint was that the ATM had “swallowed” there card and the bank “refused” to return it. Due to the bulk of tweets being sent in anger they are blunt and uninformative. 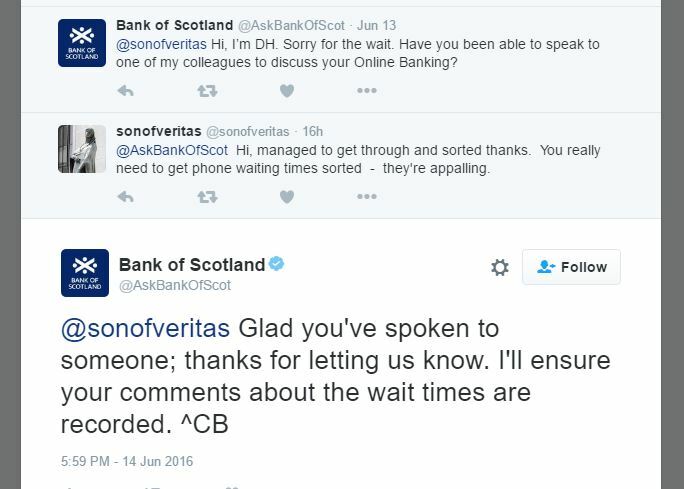 It is only one the bank has replied and asked for the information that it is provided by the user. Google+ offers discussions with other users. There is little to no discussions about ATM faults. Facebook does not have any record of any customer complaints about ATM faults. I can speculate that because the bank has control over the content on their pages they will remove any content that could fracture their reputation. Day one consisted of familiarising myself with my surroundings and building an understanding of place. Once I was settled in I was invited to a meeting in order to discuss my thoughts on the brief with both Steve Birnie (consultant industrial designer) and Charlie Rohan (senior director of user centered design). They were able to provide several names of people that work within the company that would perhaps be able to put me in contact with certain stakeholder groups along with many other useful insights. The following day I met with one of NCR’s account directors. As a sales professional he keeps a very close relationship with his/NCRs customers. He had a great deal of knowledge of what the customer wanted and was able to give detailed accounts of how much things would cost the customer and what product they would be interested in. I was informed that the rise of the ATM has allowed for banks to move staff out onto the floor instead of behind the glass screens, allowing for more immersive interaction. I was then informed that these days the consumers can even do all there banking at home on their computer or mobile device and avoid the bank all together. Following on from the conversations I had at the start of the week, I created my first iteration of a stakeholder’s information sheet. This sheet detailed my current knowledge of what roles each stakeholder played as well as what other stakeholders they interacted with and what observations could be made (for example a Customer Service Engineer meets the bank/tertiary business and fixed any faults, the observations that are made could include recurring harware issues or customer frustration). I then decided that it would be valuable to map out the service journey including each of the stakeholders, in order to understand where each of the stakeholders interact and to what level of communication they undergo. After this decision was made I began to think about who the stakeholders were and gained a basic knowledge of their role within the service journey. In the world of design, collaboration is a tool used almost every day. For example, you wouldn’t go about designing a dress without first asking the manufacturer the material limitations. “Banana Armour” (the product that keeps my banana fresh, day in and day out) wouldn’t have got very far if those that designed it hadn’t first asked the guys at Chiquita how big there bananas are. Collaboration is the simple act of working with someone to produce something that works. Generally, collaboration is a great tool to use in principle, buts it’s certainly easier said than done. There are so many great ideas being thought up all the time but just not enough people working together to make them happen. This was the thinking that lead to the formation of Crit-Café. Crit-Café is a monthly collaboration event that encourages anyone to bring and share or refined ideas – to take them to the next level. Great things are almost always born from a fusion of innovation and collaboration. One of the greatest examples of this is Apple, ask yourself who invented the first Apple product? Most of you will say the late and great Steve Jobs. In fact the first Apple product, the “Apple-II”, was created by an interdisciplinary group of collaborators. Steve “Woz” Wozniak an electronic engineer hand-built the device in hopes to sell it for $40, Steve Jobs brought it to market and found a buyer that purchased the computer for a stagering $500 each, and finally there was Rod Holt who developed the devices unique power supply, giving the Apple-II life. These three people brought entirely different skills to the table but through working together created a movement that has changed the way we look at technology today. Collaboration reaches its full potential when people from different backgrounds meet. Everybody has great ideas that remain unused because the right people aren’t there to make it happen.